I have to admit, I was pretty excited when I heard Clive Barker was writing a new novel about the characters from Hellraiser. I’ve never been a huge fan of the movie itself (and particularly not of the sequels) however I’ve always liked the characters and ideas behind the movie, so I figured that if Barker had 100% creative control and no limitations (budgetary or otherwise) he’d write one hell of a Pinhead story (pun intended). When I found out that not only was this to be the ultimate (as in last) Pinhead story, and that it would tie in with another Barker character (Harry D’Amour, the supernatural detective who also got his own movie in 1995’s Lord of Illusions), the excitement increased exponentially. Unfortunately, all my hopes quickly drained away as I began reading this fairly bad bit of lackluster prose. I wanted to like it- I even fooled myself into liking it for a bit, but that didn’t last long. It was just an illusion of me telling myself it was better than it was. The story is basically about the Hell Priest (who hates to be called Pinhead) gathering all of the magical power in the world so he can take over hell. Harry D’Amour (and friends) is pulled into this mess and eventually Pinhead enlists him (unwillingly) to write a witnesss to his actions, to be called The Scarlet Gospels. 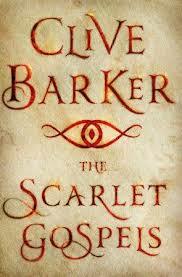 Barker has been writing for over 30 years, so it was a big surprise how amateurish and limp the writing was in this. I really don’t think he was into writing it, and was just doing it because he figures it’s what his fans want. And to be fair, it does have quite a bit of crowd-pleasing gore scenes, but not much in the way of disturbing ones (he flirts with some truly disturbing events a coupe of times, but never really lets loose). I also think that knowing more about Pinhead (some of the other Cenobites are mentioned briefly) and where they come from makes them lose some of their appeal. I think it’s a much cooler idea that they come from a pain dimension that no one can understand (and they can’t understand not knowing pain) than finding out they are priests in hell or demons. So I wasn’t too keen on this one. It’s just missing something… some thoughtfulness or dark nuance that he had previously that he’s somehow lost here. Most of the scenes described are unbelievably ridiculous (not in a good way) and the characters are mostly cardboard and unengaging. It’s really too bad, since Barker was supposed to be the “future of horror”. I know he hasn’t been well in awhile, and that might affect his writing some, but I know he can do betteer than this. Hopefully he will in the future (this would be a horrible book for him to go out on). 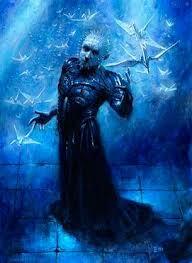 This entry was posted in books, Scarlet Gospels, Uncategorized by deadthyme. Bookmark the permalink.